Bangkok (Thailand) – October 24, 2017 (travelindex.com) – The first Mekong Trends Aviation Seminar, organised by Destination Mekong in partnership with Amadeus and the Mekong Tourism Coordinating Office (MTCO), shows regional aviation growth continues at an impressive pace to meet demand. 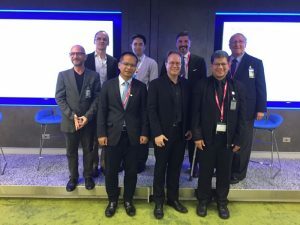 The event took place on 10 October at the Amadeus Executive Briefing Centre in Bangkok and was attended by leading travel and tourism professionals as well as members of the media and academics. The dynamics of the aviation sector in the Greater Mekong Sub-region (GMS) as well as highlights in the first Mekong Trends Snapshot on Air Transport in the GMS were underlined by experts in the aviation and tourism sectors, including Bangkok Airways’ Peter Wiesner; Oman Air’s Joseph Cusmano; Vietnam National Administration of Tourism’s (VNAT) Le Tuan Anh; Tourism Authority of Thailand’s (TAT) Chattan Kunjara Na Ayudhya, MTCO’s Jens Thraenhart and Amadeus’ Marco Weigang. Industry experts agreed that one the most dramatic regional trend was Vietnam’s accenting into a new aviation powerhouse. “Although Bangkok remains the leading hub in the region, it has lost opportunities to Hanoi and Ho Chi Minh City, which have evolved into gateways for the Mekong region”, said Peter Wiesner, special advisor to Bangkok Airways CEO. According to the Mekong Trends Snapshot on Air Transport in the GMS, the region aviation sector has grown rapidly over the last two decades. In 2015, GMS airports received more than 250 million passengers. Across the region, there are a dozen airports with an annual carrying capacity of more than 10 million passengers. In addition, there are about 30 smaller airports with annual capacity of one million passengers. The GMS is also home to some 20 airlines, including legacy carriers such as Thai Airways International and Vietnam Airlines and low-cost-carriers including Thai AirAsia, Vietjet, Nok Air and Thai Lion Air. The Mekong Trends Snatpshot on Air Transport in the GMS study was authored by Luc Citrinot, Editor-in-chief of ASEAN Travel. He also moderated the seminar and reported that new air routes have opened annually with a trend for new flight serves between secondary destinations and major aviation hubs both internationally and regionally. According to Chattan Kunjara Na Ayudhya, TAT Deputy Governor for Policy and Planning, the major shift in trends has been the emergence of low cost airlines. “We recognise the importance role the low-cost carriers play in linking secondary destinations that we also want to promote to spearhead tourism income. So we launched strategic campaigns with these airlines to highlight our new marketing promotion such as paining a Thai AirAsia aircraft with ‘Amazing Thailand’ destinations. “Although ground transportation is improving, the fastest and easiest way to travel point-to-point is to fly. When we conduct surveys, most travellers mentioned that flying remains their first travel option”, Mr Chattan, added. Airlines in turn want active common promotion from travel and tourism leaders to capture increased demand. Despite challenges, the panel agreed that GMS aviation will continue to grow and will still witness tremendous changes over the coming years. The report was presented during the Mekong Tourism Forum in Luang Prabang for the first time and can be downloaded for free at www.mekongtrends.com. Mekong Trends is an insight platform to highlight key issues and trends in the GMS under the Destination Mekong public-private partnership framework.